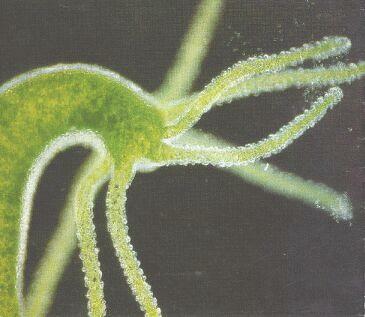 Hydra are freshwater relatives of corals, sea anemones and Jellyfish. They have a radial symmetrical body plan and stinging tentacles on the oral surface. They are very small adn typically only grow between 15-25mm in length. The gastrovacular cavity has only one opening. Hydra two sheets of tissue comprised of an ectoderm and endoderm that are separated by the mesoglea. Hydra spend their whole lives in a polyp form attached to aquatic vegetation of submerged rocks and twigs via a basal disc. Their stinging tentacles capture any food that happens to come into contact with it. Reproduction is carried out in the summer months and is largely asexual through budding. Clean, freshwater bodies of water with slow moving currents. Hydra are a common species subjected to experimentation and observation. They are frequently found in high school and collegiate laboratories due to their simplicity. "Hydra (Hydra spp.)". Northern State University. Retrieved from: http://www3.northern.edu/natsource/INVERT1/Hydra1.htm.